What I pack for a weekend trip depends on what I know I’m going to be doing while I’m away from home. If I’m not sure what I’ll be doing while away from home I’ll pack what I I know I would use, such as what I carry around most days and things that I can use for quite a few things. Before I start packing for a trip I think about what I want to try out and then figure out what I’ll need to accomplish them. The first things I pack are a main camera body, lens, and a flash. As well as extra batteries for each and my camera battery charger. Then I decide if I’m really going to need a second camera body, and I’ve realized for a weekend trip where I’m not planning on doing things that require a second camera I just pack the one. Choosing lenses isn’t always the easiest since I’m not always quite sure what I’ll end up doing. I love my 70-200mm f/2.8, but I’ve found that for a weekend where I’m able to get close to things I want to photograph it’s not something I would be reaching for. I’ve packed my 24-120mm f/4, 16-35mm f/4, and 50mm f/1.8 lenses because I know my 24-120 is good for most of what I’ll be doing. I packed the other two lenses because I want to start using them more. When it comes to choosing a camera body I just think of which one I want to use. For this trip I packed my D500 since I just got it and I want to use it more. Other than having a flash in my camera bag that’s it for equipment. I have my tripod with me just in case I might need it. I also have my laptop, laptop charger, external drive, camera card reader, camera rain sleeves, remote trigger, and gaffer tape. What I’ve packed is pretty much what I have in my camera bag ready to go, but with just a bit more since I’m not fully sure what I’ll need while away from home. 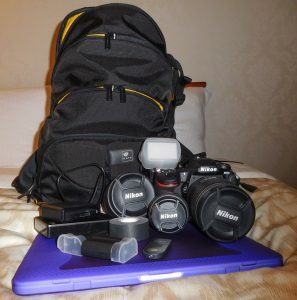 This entry was posted in Blog Posts, Photography and tagged in photography, what I pack.